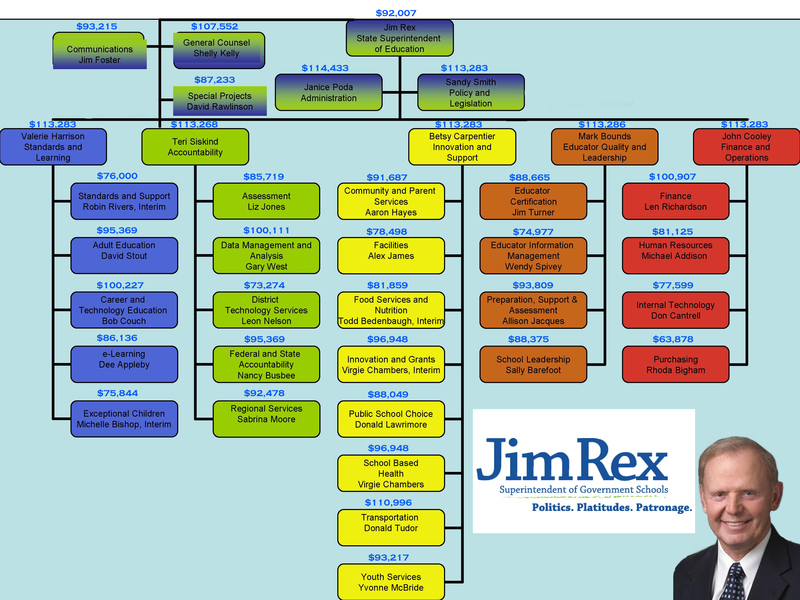 How has Jim Rex and his $3 million staff done? That’s a good question, and one that parents and taxpayers throughout South Carolina are asking. at least the past three years. Head in the Sand: parents aren’t always looking critically at their local public schools (and “Dropout Jim” Rex is thankful). Business leaders are more realistic about South Carolina’s failing government schools than the parents whose children attend them. That’s according to yet-another high dollar “survey” by South Carolina’s Educational Barney Fife (the EOC). Two-thirds of S.C. business leaders say the state’s K-12 public school system is not providing students with key knowledge. That contrasts with how parents and educators rate public schools. Nearly half of parents and 56 percent of educators say schools are getting the job done. Based on the wide spread proliferation of “dropout factories” in South Carolina, as well as the fact that South Carolina’s so-called “best public schools” are underperforming their regional and national peers, this frustration is well justified. Sadly, many parents seem to ignore reports on worsening college preparation, sinking SAT scores in wealthy white suburban school districts, and rampant fiscal waste that draws precious public resources away from the classroom. Other parents have begun to clue in. These are the parents who have gone to Columbia to demand real reform. These are the parents who have challenged the failed polices of Jim Rex directly. These are the parents who have called out politicians blocking reform. These are the parents who have taken on powerful special interest using public money and position to fight reform. These are the parents who demanded anti-reform newspapers and editors be held to their own words, and used opinion pages to voice their righteous discontent with the shortcomings of a one-size-fits-all government school monopoly. These are the parents who are tired of public schools blaming parents for their systemic failures. These are the parents who want School Choice -in the form of educational tax credits– to provide every child in South Carolina equal access to the classroom, teacher, and curriculum best suited to the children’s specific learning needs. In South Carolina one-size-fits-all government schools, it pays to fail! In other words, the principal of a notoriously ineffective public school is now in charge of the statewide effort to turn around all the South Carolina “Dropout Factories“. Frustrated parents know that low test scores, growing race- and wealth gaps, a 55% graduate rate and a surge in the number of failing public schools are a long term trend in South Carolina public schools. The so-called “watchdog” of public school accountability and performance is the oddly named Education Oversight Committee (EOC). From late and vague school report cards to watered down standards and even deliberate dishonesty, the Public School Establishment in South Carolina is fiercely dedicated to spending public money on hiding its performance failures. The Voice has often written about the shameful and growing achievement gap in South Carolina’s public schools. It is a subject that Jim Rex and other so-called “progressive” government school monopolists don’t like to talk about. In fact, few people in South Carolina are familiar with the Education Oversight Committee’s (EOC) so-called “2010 Goal,” the latest state program aimed a reducing the gaps and raising South Carolina’s position in 50-state student achievement rankings. Recently the EOC released data about “progress” made in South Carolina’s public schools toward reaching the goal. There was very little good news. …In science it rose from 24.3% to 32.4%. Failure? Nothing! I see NOTHING!!! Today the South Carolina Education Oversight Committee is scheduled to discuss where South Carolina public schools stand ten years after the institution of the Education Accountability Act. Unfortunately many South Carolina families already have to see first hand how poorly their local public schools perform when it comes to meeting educational goals. This year, four out of five public schools failed to meet the mark for Adequate Yearly Progress. Equally disheartening were South Carolina SAT results, which showed only 7 of 85 districts with average scores above the national average. Even the SAT scores of the state’s highest performing school district were hundreds of points behind similar districts in North Carolina. Lowering the standards for School Awards? With bumper lanes everyone is a winner! The South Carolina public school machine operates through a bewildering assortment of committees, task forces, subcommittees, advisory panels, working groups and inter-agency partnerships. One of the responsibilities of the EOC’s ASAS is determining eligibility for public school awards. In late November the subcommittee submitted recommendations to re-write guidelines for the Palmetto Gold and Silver Awards.